The following materials have been created to help you promote your event in Monterey County. Most can be customized with your logo, event name and dates. Browse our options below and download your preferred format, print or digital. Details are included if special programs are needed to edit the files. Place our digital banners on your website or in email communications to attendees to get them inspired about attending and engaging at your event. 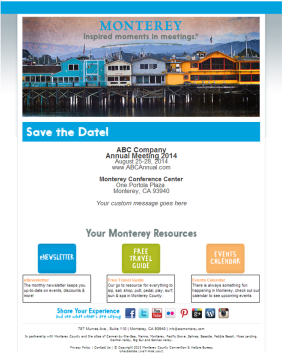 Use our Save the Date email template to promote your upcoming event in Monterey. We will provide you with an editable HTML file with the image of your choice or a custom HTML file with your event information. Download our sample email to see the different options and contact us at Sales@seemonterey.com for more details. Monterey's breathtaking scenery, rich history, world-renowned attractions and outdoor adventures invite one to grab life by the moments! 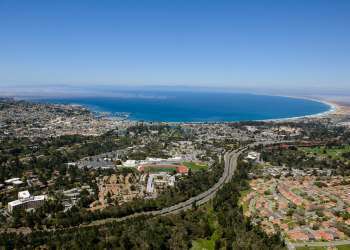 Learn more about your destination at www.SeeMonterey.com. Monterey County, the gem of California's stunning Central Coast, features unmatched natural beauty and hard-to-beat attractions. Lauded frequently in the press, Monterey's beautiful hotels, legendary golf courses, award-winning wine country and other inspirational assets rank among the best in the world. Learn more about your destination at www.SeeMonterey.com. Engage your attendees on Facebook or Twitter with fun and fascinating Monterey destination facts. Use this tool to promote your upcoming event or blast out ideas for unique experiences during your conference. Click here for a list of fun destination facts or test your attendees’ knowledge with a list of Monterey firsts.